· The legend of the origin of the Birman is that a Grand Lama of a Buddhist temple in Burma was killed and a white cat jumped on his body and stayed with him while he lay dying. The temple’s goddess turned the cat’s white fur into gold the cat’s eyes reflected sapphire blue of the goddess’ eyes. The cat’s legs and tail took the brown color of the land but the cat’s paws which rested on the priest’s body remained white in a symbol of purity. · The Birman is believed to be a product of natural mating between the Siamese, Angora and the Persian in Southeast Asia. 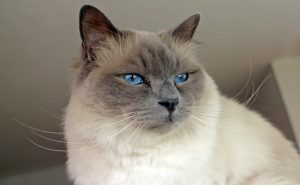 · The first supervised breeding of Birmans was in France in the early 1900’s when a pregnant female was brought to the country. · In 1925 the Birman became officially recognized in France as a breed called the Sacre de Birmanie. · The Birman was introduced to the United States in 1959 and became recognized by the Cat Fancier’s Association (CFA) in 1967. · The Birman’s body is long and massive but well-proportioned. · They can weigh between 3 to 6 kilograms. · The legs are thick and long with short paws. · The Birman’s head is broad and round. · The face is pointed with broad cheeks, strong mouth and thick whiskers. · The ears are large and alert. · The nose is long and straight. · The eyes are blue, round with a slight slant. · The Birman has a semi-long haired coat that feels silky with little or no undercoat. · The hair is short on the muzzle and thick on the cheeks, neck, belly and tail. · All Birmans have the Colourpoint pattern. The hair on the body is pale golden cream while their face, ears, four legs and tail are a darker shade. · The Birman’s unique feature are the symmetrical white “gloves” on the paws. · The white on the front paws should end on an even line across the paw. It should not pass beyond the junction of the paw and the leg. · The white on the back paws should taper up the back of the leg until just below the hock joint. It contrasts with the main point color of the leg. · Colorpoints may come as a solid color or have the lynx pattern. Some Birmans also have the tortoiseshell pattern. · Solid means that the darker color on the points is the same shade all over. The seal point cats have dark seal brown points. The blue point ones have gray-blue points. The lilac points have pearl gray points. The chocolate points have chestnut brown points. The red points have orange points. · The lynx pattern, also called lynx point, has a distinct M on the forehead, light “eyeglasses” lines around the eyes, spotted whisker pads, solid ears and have rings and stripes on their legs and tail. · Birmans are sociable, gentle and affectionate cats who like to follow their humans around. · The Birman’s curiosity can sometimes get them into trouble but they are not troublesome by nature. · They are talkative but have a softer voice than the Siamese. · Birmans are intelligent and can be trained to obey some commands and to do some tricks. 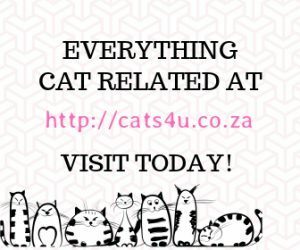 · They somewhat differ from other cat breeds because they prefer to stay ground level, so it is unlikely to find a Birman balancing on beams or hanging from curtains. · The Birmans are tolerant with children and can get along well with other cats or dogs. · They are generally laid-back but can also be playful. · Birmans crave the attention of their humans so they are happiest when living with a human who has time to play, talk and cuddle with them. · Birmans have little or no undercoat so they are is not prone to hair matting or too much shedding. However, they shed their winter coat in springtime so expect more hair during that season. · They require only moderate grooming consisting of regular combing and brushing. 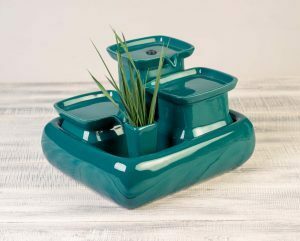 · The Birman is very particular with litterbox hygiene so humans living with Birmans must clean the litterbox often, otherwise the cat may stop using it and start eliminating in inappropriate places or develop urinary tract problems. · Birmans can adapt to both indoor and outdoor living but it is better to keep them indoors. · The white on the back of the hind legs of the Birman are called laces. · Birman kittens are born white and their color points develop only a few months later in life. 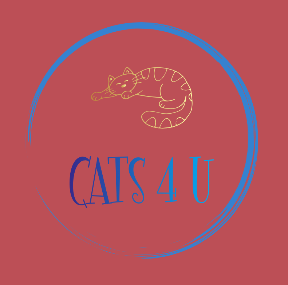 · This breed is known as the Sacred Cat of Burma and was once revered as divine. · The Birman has a lifespan of between 12-16 years.